A restaurant in Pennsylvania, USA, has recently banned children below 6 years of age from entering their doors. The reason? Younger kids are often difficult to control and end up disturbing other customers’ dining experiences. 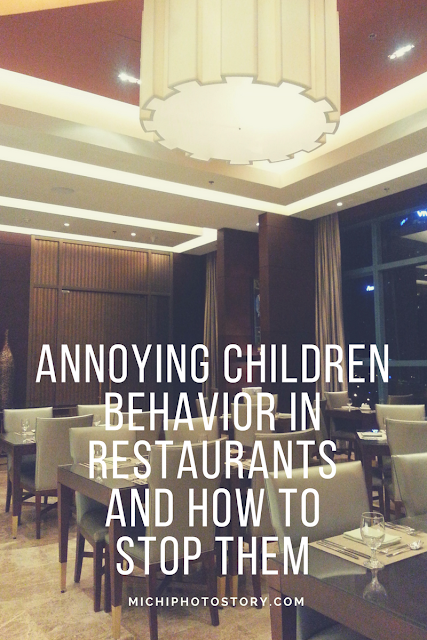 Whether you agree with the action or not, you have to admit that as a parent, there have been times when you were unable to stop your child from misbehaving in restaurants. As you know, it can be quite embarrassing. Some parents might not even be aware that their kids' actions affect others. As a guide, here’s a list of annoying children’s behavior in restaurants from parents and restaurant goers. After the list, you’ll also find tips on how to minimize these types of disruptive actions. While everyone may not agree on what the proper decorum is in a public setting, it’s worth mentioning that everyone must be considerate of others. How do you get your child to behave better in restaurants? It’s easier to train and reprimand kids 3 and up. If you have a younger toddler, you may want to bring her to kid-friendly restaurants especially if you know it will be difficult to control her. In going to places that are more tolerant of kids, other customers who enter are aware that their dining experience may be interrupted by the occasional scream or flying food. Teach your child that there is a time and place for everything. A play area is for playing, while a restaurant is for eating. Tell her she can run, skip or hop to her heart's content inside a play area. However, she should only walk and stay glued to her chair when dining out. 3. Set expectations before going to the restaurant Lay some ground rules. Prior to leaving for the restaurant, have a little chat with your child about how she should behave while dining out. Use positive statements as much as possible, such as: use your quiet voice, food should stay on the plate (as opposed to under the table), walk only, sit still on the high chair, etc. Emphasize that other people eating in the restaurant should be respected by showing them proper behavior. Take your child’s favorite toy(s) along to keep her occupied in the restaurant. You may also take crayons and coloring books to keep idle hands busy. Make sure your kid is well-rested so she won’t be cranky. This decreases the chances of a major meltdown from taking place. Just because you did steps 2 and 3, it’s not a guarantee that your child will remember to behave the entire time. Be prepared to reprimand her throughout your dining experience. If your kid misbehaves (she is a child, after all), respond to her in a calm manner. If she doesn’t stop crying loudly, step out of the restaurant until she is ready to enter again. Conclusion: It’s every parents' responsibility to teach their children how to behave when dining out. Use the tips above to make your dining experience a better one for your family and other restaurant patrons too. Today’s guest post is by Anne Mercado of Green Eggs and Moms. Anne is a mom who is passionate about raising happy, healthy and smart children. How? With a glass of information, a pitcher of love, a gallon of patience, and of course, a bucket of humor. She believes that though parenting is challenging, it doesn't have to be boring. I loke this post sis. It's true that kids really are hard to control. Although I don't necessarily agree with the ban, I do agree with you that parents must be considerate of other people too. Formal dining setting are not appropriate places for children anyway but parents should not have waited for bans when even thinking of not bringing their child in. Tin - You're right that parents need to know when to bring their children to restaurants or not. Michi - Thank YOU for posting it :) I really really appreciate it.